Assistant professor Ryan Graham makes adjustments to the motion capture suit worn by student Shane Petersen. 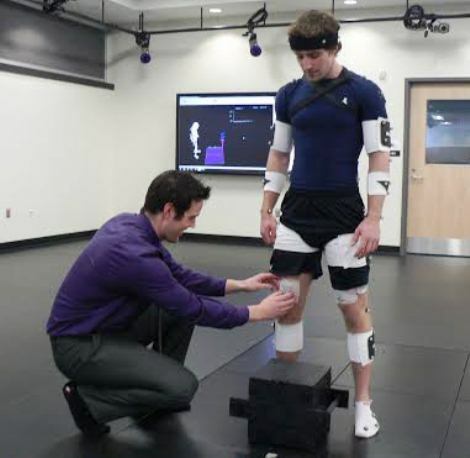 The suit allows for high speed motion capture and the analysis of muscular acrivity. Nipissing University is about to embark on world class research that will help understand lower back pain, and how humans respond to work and exercise in extreme climates. Part of the $430,000 grant announced by Nipissing-Temiskaming MP Jay Aspin will go towards research by Assistant Professor Dr. Ryan Graham into understanding lower back pain mechanisms and risk factors such as spine instability and impaired neuromuscular control. “If anybody has any sort of workplace tasks that are causing different injuries to their workers and they’d like to have them assessed in a quantitative manner, we have all the tools to assess muscular activity, motion and different torques on the human body,” he said. Also unveiled was a research lab, that looks from the outside like a giant meat locker, that will study human response to work and exercise in extreme climate….hot, cold, dry, humid, low and high altitude. “At this point the opportunities are probably beyond our imagination about what we can accomplish.” said Dr. Graydon Raymer, the associate professor researching how health is affected by the heart, lungs and muscles being synchronized during physical activity. The funding comes from the Canadian Foundation for Innovation, which supports cutting-edge research equipment. Labs and tools researchers use to improve the lives of Canadians. “The value of this fund is priceless”, said Aspin. “In today’s world, science technology and innovation is where it’s all at. The top countries of the world are the innovators of the world that focus in on science." Aspin also confirmed that expects a major aerospace announcement for North Bay to be made in early May. Also receiving funding is Dr. Adam Csank, the assistant professor of geology, to establish a light stable isotope mass spectrometry facility.